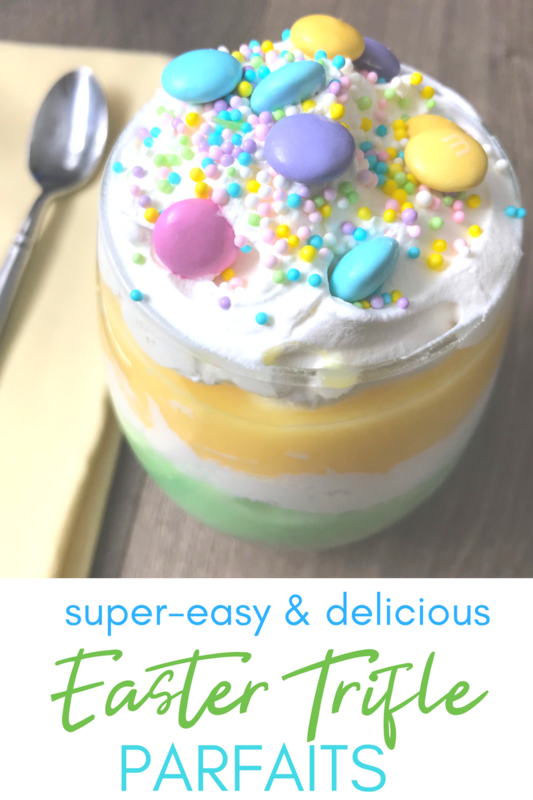 If you are in need of an easy Easter dessert, this trifle parfait is the perfect choice! 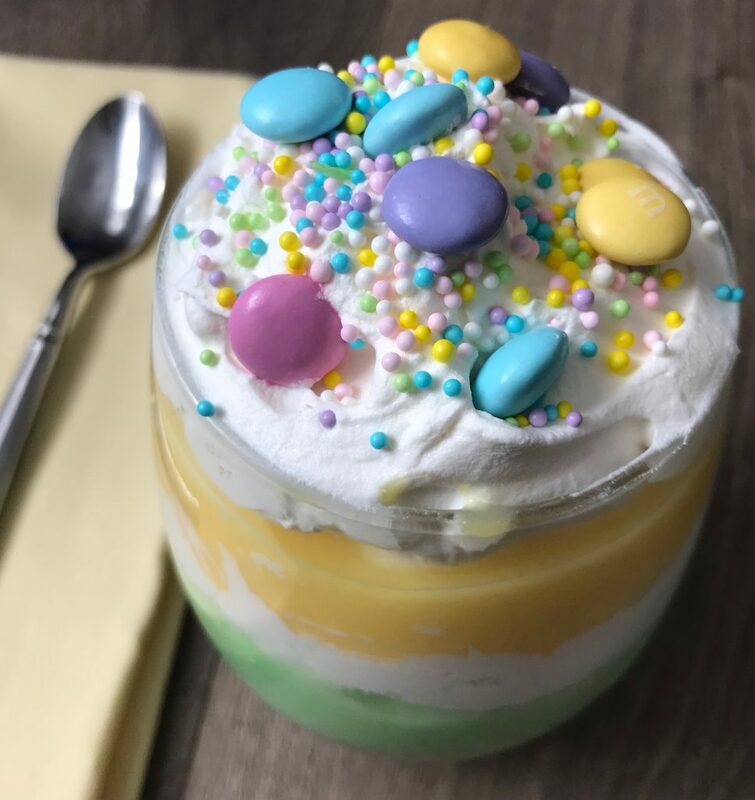 With a wide choice of color and flavor combinations, you can create a no-fail spring dessert that quick fix for you and a mouthwatering treat for your guests! 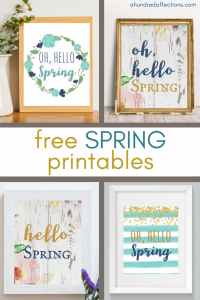 If your family is anything like mine, whenever there’s a family get-together or celebration coming, we all divvy up who is going to make what – appetizers, sides, main dishes and desserts. In my family, I’m usually the one who is assigned dessert. Not because I’m so great at desserts but more like because I’m NOT so great at cooking. But I don’t mind. Baking is way easier than cooking, in my opinion, and so much more forgiving. I mean, when there is sugar and butter involved, how bad can it taste? You really can’t mess it up. The trifle (or the parfait, if you are making individual servings) is my go-to. With alternating layers of cake (or brownies or cookies, even), pudding and whipped cream, it is SO easy to make, and it is a hit every time. It’s almost embarrassing to take any credit for it. 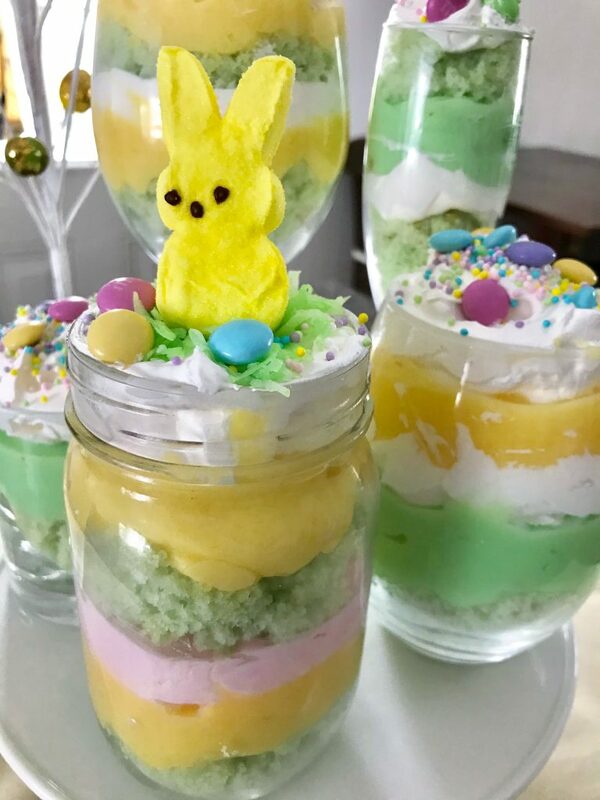 If you like to bake or if you’ve been designated family dessert girl, here’s a great spring or Easter dessert recipe to bring to your next get together. This is super-easy to make, and there really is no way you can ruin this. You have so many ways to put together this trifle or parfait. 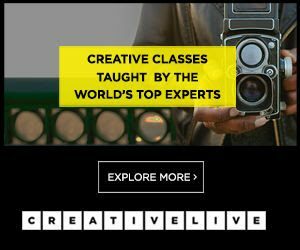 This post contains affiliate links; I earn a small commission from items purchased through these links at no extra cost to you. 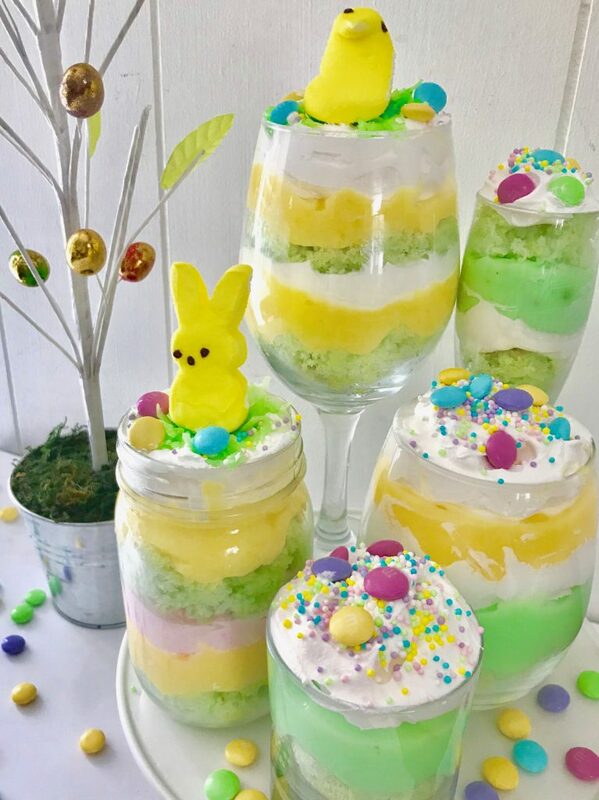 I’ve made this dessert both ways – in a big bowl as a trifle as well in individual glasses as parfaits. The bowl trifle is definitely quicker and easier, so if you aren’t super concerned with presentation, it’s a great choice to make. Your guests can just slop it on a plate – the more mushed together it is, the better it tastes. I made this trifle with my mom when I was visiting her in Florida with the boys. For this one, I used Funfetti box cake mix, vanilla pudding, pistachio pudding and heavy cream. 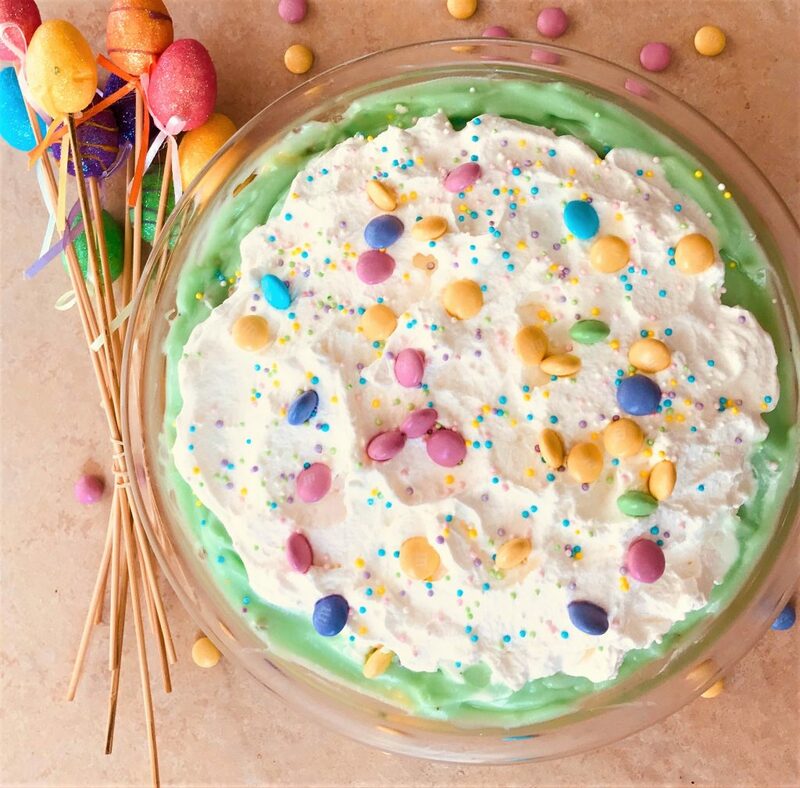 We topped it with spring sprinkles and spring M&Ms. 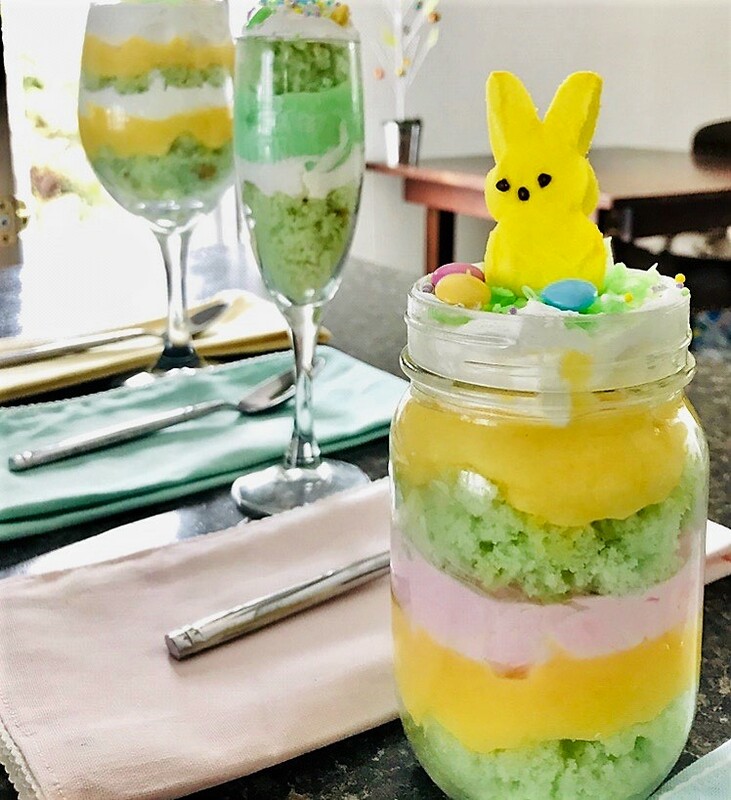 There is a little more involved in assembling the parfait compared to making a trifle, depending on what glasses you use. If you use a wider mouth glass, it is easier to get the ingredients in without having them drip and smear down the sides. If you don’t care about that, no problem. But if you want it to look nice and neat from the outside, go slow in putting the ingredients in. I had to wipe the inside of the glass clean with a damp paper towel as I went, before I added the next item. I bought a white cake mix and added blue food coloring, hoping to get a baby blue cake. However, the cake mix, even though it said ‘white’ had more of a yellow tint to it, so the cake was more green than blue. 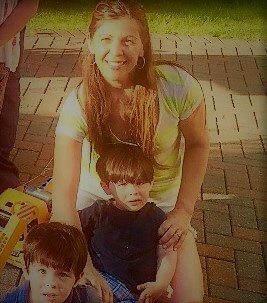 Not a huge deal because it was still in the spring and Easter family, but it wasn’t totally my intended outcome. This time, I used banana pudding instead of vanilla, and I still used pistachio. In retrospect, I feel like the banana taste was a little too strong, so I would probably go back to using vanilla. I used Cool Whip this time around because – the real story? My hand-mixer is boxed up in the shed somewhere because we are (hopefully) moving soon. I didn’t have anything to beat the heavy cream with, so I just bought Cool Whip. I kept it in the fridge instead of the freezer, and it was just the right consistency and still tasted delicious. I started with cake the bottom, then added banana pudding (so as not to have 2 green elements side by side), then Cool Whip, then cake, then banana (or pistachio) pudding, then topped with Cool Whip. For some, I just kept it mostly green and omitted the banana pudding. If you are making a parfait rather than a trifle, you can change up the combinations any way you want. I also added a little pink food coloring to the Cool Whip, and it was a nice touch. You could definitely color the Cool Whip or whipped cream to change up the color combinations. I used colored spring sprinkles from Wilton and spring M&Ms. On top of a few are your traditional Peeps. I also used green-dyed coconut to make the bed of grass the bunny and chick peeps are sitting on. With the ingredients listed above, I was able to make one large trifle. 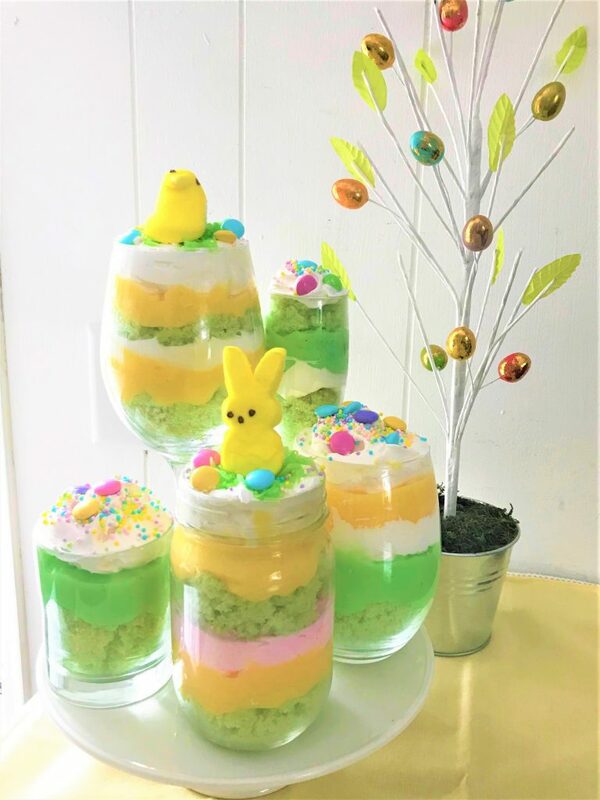 Using those same ingredients, I was able to make the 5 glasses of the parfait as shown in the picture (varying sizes, but 3 were pretty large), with about a 1/2 cake left over and a little bit of pudding. My glasses were all different sizes, but you could definitely use smaller ones (clear plastic party cups are a great choice) and make a nice amount for a larger group. If you REALLY wanted to make this a baking hack, you could just buy a box of Entenmann’s cake and store-bought pudding! I’ve never used pudding cups when I’ve done this, but in the past, I have definitely used cake that was pre-made. (Even I can handle making instant pudding, lol). What are your favorite, go-to, super-easy desserts? Let me know! I’d love to hear about them! If you think others might enjoy this recipe, I’d love it if you shared it!